Kevin took me out to a nice restaurant for dinner and I was surprised to find that he had brought a gigantic bag of potato chips with him. "Eat some!" he said, "They'll make the whole evening go by faster." At the time I wasn't sure why I'd want the evening to go by quickly. But as he just sat there and polished off the whole bag of chips, it began to dawn on me. He put chips on his appetizer salad and even dipped one in his Coke and ate it. The chips were about done by the time our food came and he said, "I'm sorry I ate most of them. Here," and then he brought the mostly empty bag over my food, apparently intending to cover my dinner with the remainder of the chips. I shoved the bag away before he could do much damage. He then tried to do it again as if I was the one mistaken. I again pushed the chip bag away and he asked me, "What's wrong?" I said, "I don't want chips on my dinner. Is that all right with you?" He said, "Not really, but I guess I'll be all right with it." We split dinner and on our way out he asked me if he could buy me a bag of potato chips. I declined and he then seemed in a hurry to leave. That made two of us. "It'll make the evening go faster" was right, just not the way he probably hoped. Also, he was either an idiot, or more likely, suffering from a specific type of disorder that makes you fixate on one thing, such as potato chips. Even more likely, it wasn't the chips themselves he was obsessed with but the texture or the crunch. Goddamnit! Stop talking so enticingly about chips! Haven't all of our waist lines suffered enough since last Thursday? I'm sorry! DON'T eat delicious cool rance doritos for their perfectly seasoned crunch. DON'T munch one some nacho bugles, perfectly shaped to fit on your fingers to create claws. NEVER EAT CHIPS, THOSE DELICIOUS, DELICIOUS MONSTROSITIES. Were the chips Doritos? 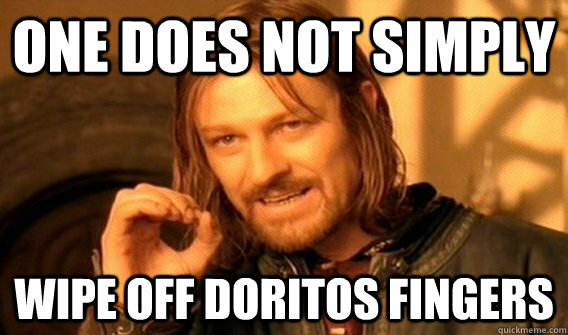 Did he have orange fingers that he kept licking and then shoving back into the bag to get more chips? Because that's what I'm picturing. Maybe he was addicted to spuds. New favorite song to listen to 500 times in two days nonstop until I hate the song and myself and oh god, why do I do this to myself. "brought the mostly empty bag over my food, apparently intending to cover my dinner with the remainder of the chips." It wasn't about the chips, it was about the roofie in the bottom of the bag.